Before the discovery of anaesthesia there were several different methods that surgeons used to dull the pain of the anxious patient. Herbal remedies such as wine made from the root of mandrake was thought to numb the pain of amputation. Opium and alcohol were also used by patients to alter the patient's state of mind so pain and reason where unattainable. Even methods such as freezing, hypnosis, and asphyxiation were implemented to attempt to dull pain. The father of modern anaesthesia, William Morton, was an American dentist and physician. After testing a sulfuric ether mixture on his dog, his assistant, and himself, Morton used a ether saturated handkerchief on a patient who needed his tooth pulled. The first implementation was a success and word of the new pain free surgery spread throughout the northeast. 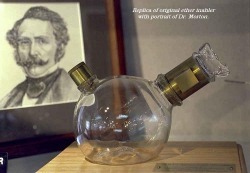 Morton developed an ether inhaler which allowed the patient to breathe ether without using a primitive handkerchief. 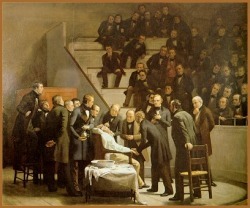 Within weeks Morton was asked to utilize and demonstrate the power of his anaesthesia at the Massachusetts General Hospital, located in Boston. Sulfuric ether was not the only substance used for anaesthesia. Chloroform and nitrous oxide were also employed on patients. October 16th, 1846, well-known surgeon John Collins Warren tested Morton's sulfuric ether as anaesthesia in the Massachusetts General Hospital with an audience of other surgeons. Warren removed a tumor from the patient's neck without any issue after only thirty minutes. Quickly, surgeons realized the importance of such a substance which allowed surgery to be unrushed and thus safer and more effective. Ether was not the sole anaesthesia at the time. Other scientists such as Humphrey Davy discovered the importance of nitrous oxide in the mid-1800s. Chloroform was also used as a type of anaesthesia introduced by James Simpson. After its establishment chlorofrom was used extensively in Britain for several decades.